First, you have to enable which marketplaces you want to sell on in your Amazon settings. 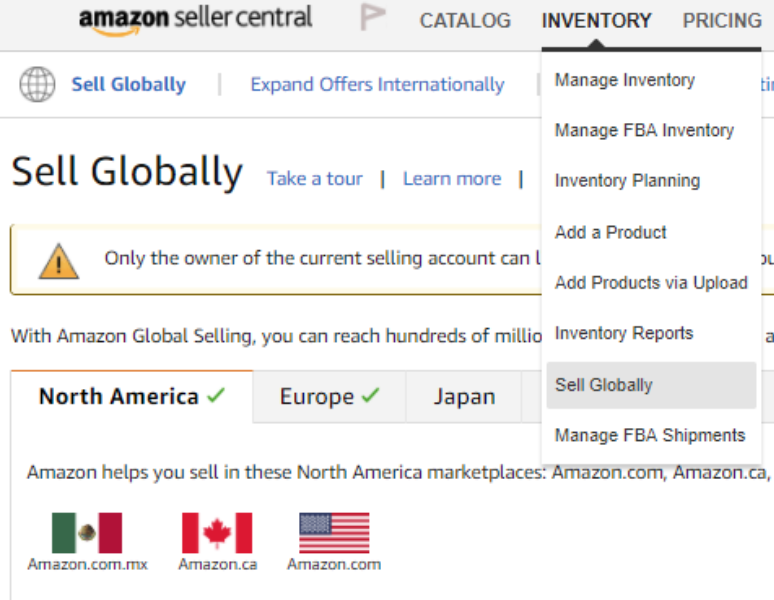 To do this, in your Seller Central account, go to Inventory → Sell Globally. Then click “Register Now” and follow the steps for each marketplace you want to sell on. If you have any problems with this step, please write to Amazon support directly. And keep in mind, you have to pay monthly selling fees for each region you sell on. Then, when you're setting up your Printful + Amazon integration, select which regions you want to sell on and authorize Printful's access. If your Printful account is already connected to Amazon, then in your Printful Dashboard go to Amazon Store Settings → Amazon Regions → click Aurhorize. You'll be redirected to Amazon and asked to authorize Printful. Then you'll be redirected back to Printful where you can check the marketplaces you wish to sell on (similar to screenshot above). If you select all the regions you want to sell in during the initial setup process, then when you push a product, it'll automatically be added to each of the regions you sell on. If you want to sell different products for each region, then you'll have to go through the connect process for each region you want to sell on separately. You need to request GTIN exemption for every marketplace you want to sell on.